Hurricane Vance is located about 70 mi…115 km ESE of Socorro island and about 405 mi…650 km SW of Mazatlan Mexico with maximum sustained winds…105 mph…165 km/h. Present movement…NNE or 25 degrees at 13 mph…20 km/h. Hazards affecting land – rainfall…Vance and moisture spreading northward ahead of the system are expected to produce rainfall totals of 4 to 8 inches with isolated amounts near 12 inches through Wednesday over the states of Sinaloa…Nayarit….and Durango in western Mexico. These rains are likely to produce life-threatening flash floods and mud slides…especially in areas of mountainous terrain. Surf…swells generated by Vance will be affecting portions of the coast of southwestern Mexico and Baja California Sur today and tonight. Typhoon 20w (Nuri), located approximately 358 nm west-southwest of Iwo To, and is tracking north-northeastward at 09 knots. Nepal – An avalanche on Mount Ama Dablam in Khumjung-7 of Solukhumbu distirct in Nepal has claimed the life of a Nepali Sherpa and injured three foreigners. Three foreign mountaineers—one Swiss, one Russian and one Briton—got injured in the incident above the Base 2 on the 6,812-metre mountain. Peru – Heavy rains have resulted in floods across central Peru on Sunday. The flood water has damaged local schools and more than 100 homes. Mudslides have also cut off highways in the largely rural area. In the city of Huanuco, which has a population of 75,000, students were forced onto chairs in flooded classrooms and parents carried children on their backs after classes were suspended following the rain. 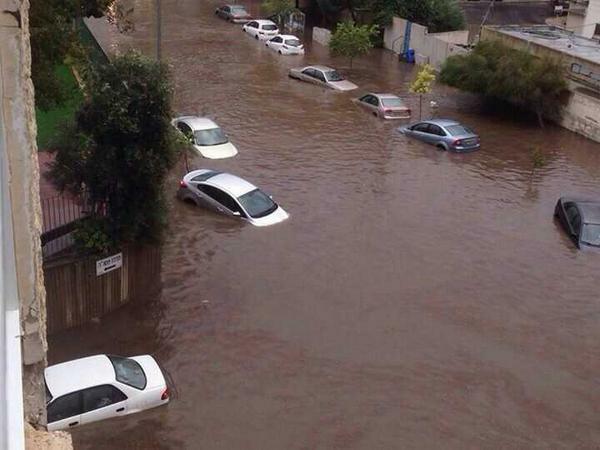 Israel – Major flooding hit several Merkaz (Central) region towns on Monday, after an unusual deluge of rainfall buckled some roads and swallowed cars on others. Argentina – 19 districts of Buenos Aires province have been affected by flooding caused by record levels of rainfall, with a total of 5,203 people evacuated across the region. Between 18 and 26 October 2014, the National IHR Focal Point of Saudi Arabia (KSA) notified WHO of 12 additional cases of Middle East respiratory syndrome coronavirus (MERS-CoV) infection, including five deaths. The reports of declining rates of new Ebola cases in Liberia, announced by the World Health Organization on Oct. 29, fuelled hopes that the outbreak response is working, but experts are cautioning that it is too soon to believe West Africa has entered a new phase of the epidemic. Liberia is one of the worst affected countries by the Ebola outbreak, with more than 6,500 cases and 2,413 deaths reported in that country alone as of Oct. 31. In addition to the perhaps positive news out of Liberia, WHO officials are saying that the total number of new cases in Liberia, Sierra Leone and Guinea may also be levelling off, with some officials telling the BBC News that they now expect the rate of new cases will be steady, at around 1,000 weekly cases total in all three countries. This is a contrast to the increasing pace seen earlier weeks, when the number of new cases was growing exponentially. Kilauea (Hawai’i): Over the past few days, there has been no advance of the lava flow front towards residences in Pahoa, though active lava continues to break out from the margins of the flow behind its farthest reach. Luckily no residences have burned so far because of this slow-down, but locals await the seemingly inevitable pressure surge which will come from somewhere on the flow in the near future.